Dubai, UAE, August 01, 2018: One cannot deny that the bathroom is one of the most used rooms in our home, so it gets difficult to keep it tidy and organized. Transforming the bathroom into an exciting and comforting space is not easy. Everyone’s bathroom is different and there’s no one-size-fits-all formula. However, the right tips to keep the bathroom organized and uncluttered, using the right mix of furniture and accessories can make all the difference in creating a sense or orderliness and space. Instead of just a basin, install a wall-hung basin unit, a storage cabinet under your vanity basin or under your vessel basin. This will give you some extra space, where you can keep all products necessary to have for immediate use around the washing area. Ideal Standard’s Connect Air range has basin units in different storage variations - with soft closing full drawers or a combination of drawer and shelf - that you can choose from depending on individual needs. And they come in 6 different finishes to help you match your tiles and general bathroom decorum. With options of 1 or 2 soft closing drawers and in 5 amazing finishes come the basin units of Tesi furniture range. Take advantage of the available bathroom accessories. Instead of having shampoo and shower gel bottles scattered around, use Ideal Standard’s shower baskets and shelves that will help you organize your shower area. Tumblers & soap dishes will do the same for your washing area. IOM and Connect ranges of accessories consist of all the aforementioned items. Add some extra storage space in your bathroom for back up towels or toiletries, personal hygiene products, cleaning products, etc. Opt for a roomy tall side cabinet with numerous shelves, which will allow you to separate all the items and store them according to use or other categorizing criteria of your choice. Ideal Standard Connect Air, Tonic II and Tesi ranges contain column cabinets in the same finishes as their basin units, with glass or wooden shelf separators and soft closing door. Put some order in your cabinets to help the bathroom look uncluttered. A bathroom has to be functional, in order to accommodate all usual equipment that is essential for a working bathroom space, and yet beautiful to help us relax and refresh. Installing furniture is a great way to accomplish both. 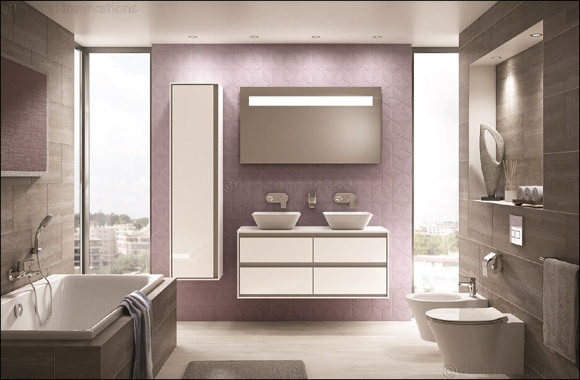 Ideal Standard offers distinct ranges of bathroom furniture to choose from; full ranges consisting of basin storage units, with drawers or shelves, worktops, tall side cabinets and mirrors in many different finishes. Depending on the style and design approach of preference, there is something for everyone. Connect Air furniture articulate the minimalistic trend for sleek and slim line interiors and epitomise the highest levels of style, function and comfort. The perfect choice for a busy family bathroom is Tesi range. The collection is unmistakable for its slender, elegant and agile features, which can be fitted into various spaces, whether a family bathroom, cloakrooms or en-suite alike. One cannot ignore Tonic II, the elegant bathroom choice that’s designed for living. Selecting from a range of modular furniture pieces, you can create a clean cut perfect look to fit your personal style and storage needs. Well, there’s no doubt that furniture plays a key part in your bathroom planning. So, if you think it’s time for a renovation or an upgrade look no further than Ideal Standard. There are plenty of mix n match ideas that can be configured to suit individual needs and spaces. As one of the leaders in creating bathroom environments Ideal Standard products offers unmatched product quality, innovation, design and sustainability leading to functional bathroom solutions, which meet every demand where aesthetics are as important as performance.